The concept went over so well last year that tournament organizers couldn’t possibly not bring it back, and they decided to one-up themselves in 2017 by expanding it to a second division this year. 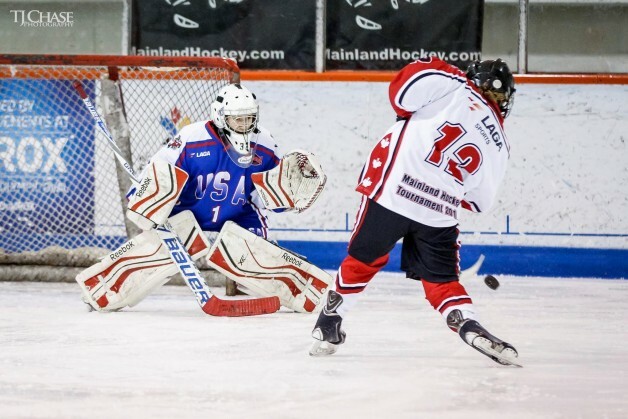 The Canada vs. USA Showcase was the highlight of last year’s Mainland Tournament, and it is expected to be even more of a draw this year. The concept started with the Pee Wee Major level last year, and will also include the Pee Wee Minor division this year. The winning team from the Canadian pool and the winning team from the American pool in those two divisions will square off Sunday in a pair of games that make up the Canada vs. USA Showcase. Best of all, teams will be outfitted in their country’s jerseys, pants shells and socks, and players will take home the entire kit at the end of the tournament. Herie said the showcase was a big motivating factor for players and teams last year, and he’ll consider adding more divisions to the showcase in future years. The Mainland Tournament will be held April 7-9 in Vancouver, British Columbia. Coaches can register their teams at www.MainlandHockey.com, and Herie emphasized that while all divisions are still open, they will fill up fast. There are divisions for Novice Minor (2009 birth year), Novice Major (2008), Atom Minor (2007), Atom Major (2006), Pee Wee Minor (2005), Pee Wee Major (2004), Bantam Minor (2003), Bantam Major (2002) and Midget (1999-2001). Herie said he expects to have between 50 and 60 teams registered in the nine divisions. One of the things that players, coaches and parents like so much about the Mainland Tournament is how well the staff treats its visitors. In addition to championship trophies for each division, there are first-place medallions and runner-up medallions, and every player goes home with a tournament gift that’s a keepsake of their trip to Vancouver. Every team is guaranteed at least four games, and with so many divisions, a majority of the teams will be playing for something on Sunday. The tournament will be hosted by Planet Ice Delta, and some games may be played at the Richmond Ice Center. Herie said the easy part of his job is getting Canadian teams to register. It’s a little harder to get U.S. teams to travel to Vancouver, but he makes a big push every year in Arizona and New Mexico, partly because they’re close geographically, but also because there is so much good youth hockey being played in those states. “We usually have a good contingent of teams from Seattle and other parts of Washington,” Herie said. “The makeup of our tournament is usually about 80 percent Canadian and 20 percent U.S. I’m hoping that by creating this showcase event, we’re giving U.S. teams a little extra motivation to want to come north of the border and play in our event. The chance to represent their country and be outfitted in their country’s gear is something that I think will attract more teams.